Pimples are a menace! You try hard to get rid of them, but they are too stubborn to come back. Bursting them doesn’t help either, because a) it hurts! b) it leaves a stubborn mark behind c) they pop-up again after you burst them. There are a lot of medicines and creams available, and while some of them do offer a temporary relief, and only to see them return with a vengeance! So does that mean there’s no cure for acne? Well, there is. To put a permanent end to this, you need to switch to a permanent solution called Ayurveda. From times immemorial, people have found the best cure for pimples in Ayurveda. Be it haldi, aloe vera, lemon, papaya or sandalwood, nature has some best resources to treat acne prone skin. A pimple develops when our oil glands become clogged and infected, leading to swollen, red lesions filled with pus. So, when dead skin cells clog the pores, infection develops and, causing pimples/acne. Some of the common causes are puberty, pregnancy, menstruation, consumption of birth control pills, junk food, lack of sleep, stress, anxiety, over use of cosmetics and staying long hours in pollution. Who is affected by pimples? It’s a prevailing myth that acne is more common in girls. On the contrary, one of the main causes of acne/pimple is the hormonal changes in both boys and girls during puberty. Hence adolescents are more affected with acne, however, it can affect people of any age, including adults. Let’s admit it – acne is ugly looking and we try to seek instant results to get rid of it. The recent new-age treatments of Acne including microdermabrasion and laser are radical and risky ways of dealing with acne. The problem is more deep-rooted and needs to be addressed with natural remedies – just as our ancestors used to do. Give your skin the benefits of organic products and win the battle against acne. Biotique has researched for years to understand what can help to reduce the outburst of acne and attain a clear, healthy skin. Along with many ingredients, Neem has been chosen as an active ingredient in removing acne. Neem has also been used as a traditional folk medicine and one of the best acne home remedies because of the aspirin-like compound that helps rid the skin of bacteria that causes acne. Along with antiseptic, anti-fungal and anti-bacterial properties, Neem also has high dose of fatty acid, to prevent scars and is non-comedogenic. 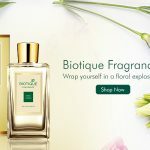 In this light, Biotique has designed Bio Neem, a purifying face wash for all skin types with the benefits of pure neem. It is 100% soap-free antibacterial cleansing gel, with no harmful ingredients and blended with the extracts of neem leaves, ritha and kulanjan that removes impurities and helps to maintain a clear, soft and pimple free skin. To make your skin supple, Bio Neem also contains coconut oil and helps removes dryness. Another accompanying problem of Acne is the marks they leave behind! One the acne/pimples die, they leave a gross mark/spot behind. Ayurvedic cure for Acne suggests that regular use of Chandan, Haldi and Multani mitti helps in removing acne scars. 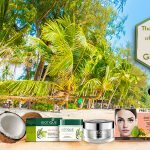 Bio Myristica and Bio Winter Green from Biotique is a spot correcting face pack that treats acne and also helps control the bacteria that causes redness and skin irritation. If you are dealing with difficult scars on oily skin, try this product and say bye to the scars! Sometimes, the marks are very stubborn and take a long time to vanish. For faster results, you can try Bio Clove Purifying Anti Blemish Face Wash for oily and acne-prone skin. This face pack has the benefits of cloves and turmeric and with the regular use the complexion looks clear, smooth and vibrant. If you are prone to acne and spending a lot of your time outdoors, you can blame the polluted air! The bad air, full of chemicals and harmful gases increases the rate at which acne bacteria penetrate your skin. So how to prevent pimples in this case? You need to gently exfoliate your skin to remove dead skin layer and improve its skin texture. Biotique’s Bio Peach can come to your rescue as an ayurvedic treatment for acne. This clarifying and refining peel-off mask is perfect for oily and acne prone skin. It is blended with extracts if peach, plum, cucumber, cabbage, neem and quince seeds to deep cleanse and purify pores. Not many would believe, but those who do would swear on acne outburst after hair removal. Sensitive skin develops a lot of pimples after shaving hair on forehead, upper lips and cheeks. Bio Chlorophyll comes handy here as it soothes the oily acne prone skin after hair removal. It is a refreshing and anti-bacterial moisturizer with chlorophyll, seaweed and aloe vera. It keeps the skin refreshing and nourished, with no flakes. Natural and ayurvedic treatments for acne are taking precedence over modern-day, invasive surgeries. Nature has all the answers for clean, clear skin and healthy skin. 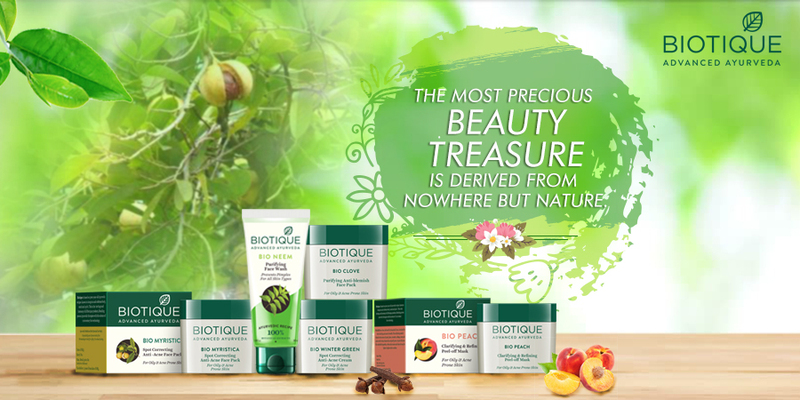 Biotique is your one-stop-shop if you are looking for original and authentic ayurvedic products for acne control. Should you have a specific skin concern, you can try take free skin consultation here and let our experts tell you what is the right product for you. We at Biotique wish you a happy, bright and healthy skin, always! 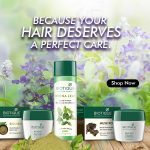 Previous Post How to Stop Hair fall the Natural and Ayurvedic Way!